Leitao a Bairrada ( Roasted Pig ) . Best in the area of Coimbra on your way to Porto. Dobrada a moda do Porto ( Tripe, chourico, pork meat mixed with white beans, accompanied by rice) . Caldeirada de Cabrito ( Stewed Kid with potatoes ). Bife a cavalo ( fried steak with eggs done over light & french fries ). Bife Grelhado com batata frita ou arroz ( broiled steak with french fries or rice ). Frango no Churrasco ( similar to barbecue chicken with fries & salad ) . Most restaurants have it but, it's Best in the Churrascaria do Campo Grande in Lisbon , close to the Sporting Soccer Club Field in Alvalade. ( everybody knows where it is… ). Arroz de Marisco ( Seafood rice ) similar to Paella, with no meats. Mariscada ( seafood stew ). Caldeirada de Peixe ( similar to the French fish stew ). 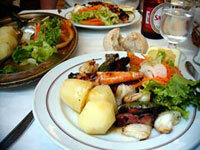 Lulas or chocos grelhado ( broiled squid or cutlefish, usually with boiled potatoes & salad ). Bacalhau a Braz ( shredded salted cod mixed with french fries, scrambled egg , parsley, olives ). All kinds of Broilled/grilled Fresh Salt water Fish including the Popular Sardines done over charcoal.